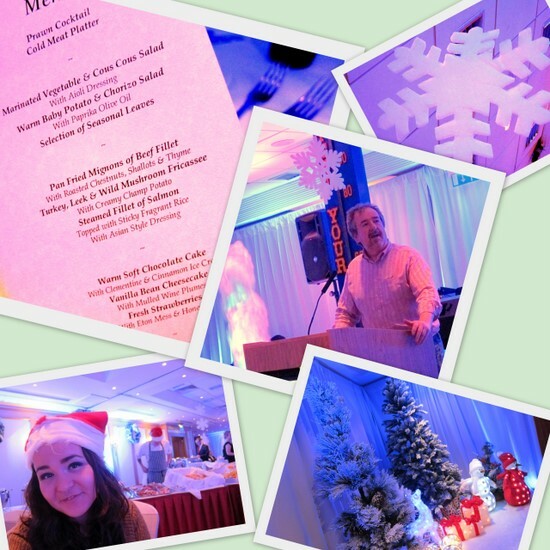 From top left - the delicious menu at The Alexander Hotel, who put on an amazing night; snowflake decorations; Walter Hegarty, Christmas FM Director, at the podium; Fluff and Fripperies in the festive spirit; Christmas decor. There will be 5000 homeless people in Ireland this Christmas - 1 in 7 of whom will be children. That was the sobering statistic we heard at The Alexander Hotel in Dublin on Friday, at the launch of Christmas FM. This year the all-volunteer station are working to raise awareness and funds for homeless charity Focus Ireland. One really easy way to show your support is by liking the Facebook page of sponsor O'Callaghan Hotels, who will donate 50c* per person to the charity. EBS and the Irish Daily Mail are also sponsoring the station. Over the past three years, Christmas FM has raised more than €200,000 for its charity partners. This year they will broadcast from The Alexander Hotel on Merrion Square in Dublin. You can listen online or by tuning into Dublin-94.3 FM, Kildare-88.1, Limerick-105.5, Cork-106.7, Galway-89.5, or South East Region-103.8. You can also follow the station on Facebook to keep up with all the news. *Apologies, my original post said €2 per person but this was an error in the speech on the night.